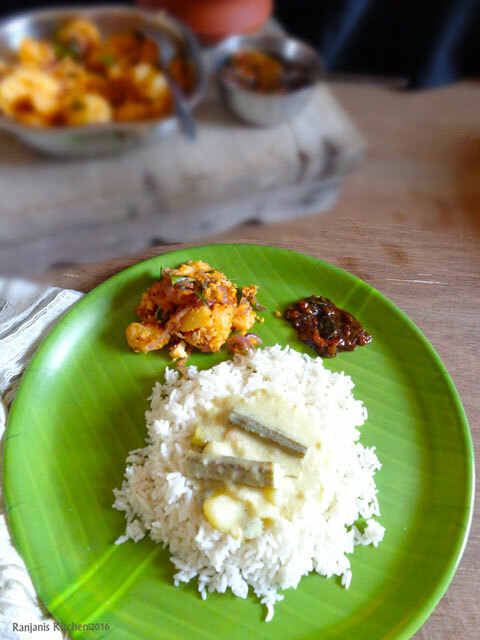 Tirunelveli sodhi kuzhambhu – authentic recipe served in marriages of Tirunelveli houses with an accompaniment of pappad, potato curry, inji puli and chips of any variety. 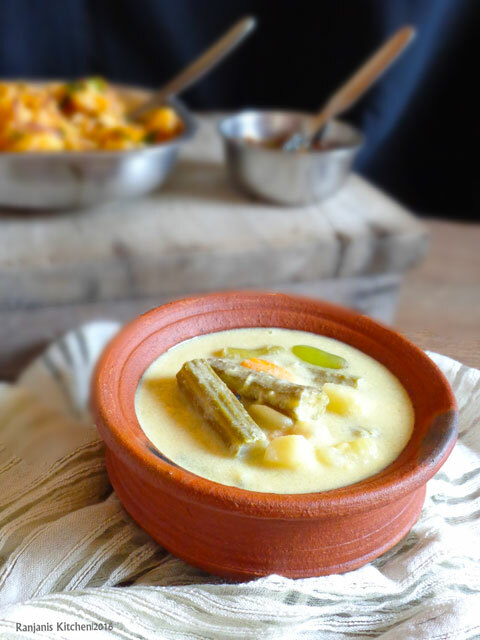 They call this vegetable stew as Mappillai sodhi as well J. 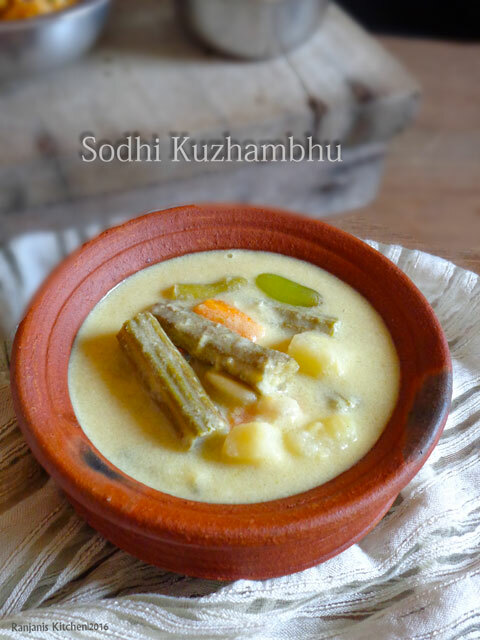 This sodhi can be served with rice or idiyappam or aapam. Shallots or small onions – 8 to 10 nos. Pressure cook moong dal with a pinch of turmeric powder and 1 cup of water for 5 hisses. Chop vegetables, extract thick and thin milk from one full coconut as mentioned level. Grind ginger and green chilli together as a fine paste. Heat a wok, add oil, saute onions and garlic together for 2 mins or till it turns light brown. Now add ginger green chili paste and stir till the raw smell leaves. Add chopped veggies and thin coconut milk and salt. Once it starts boiling add cooked moong dal.All the veggies to cook well. Add thick coconut milk and allow to boil for 3 mins and turn off the flame. 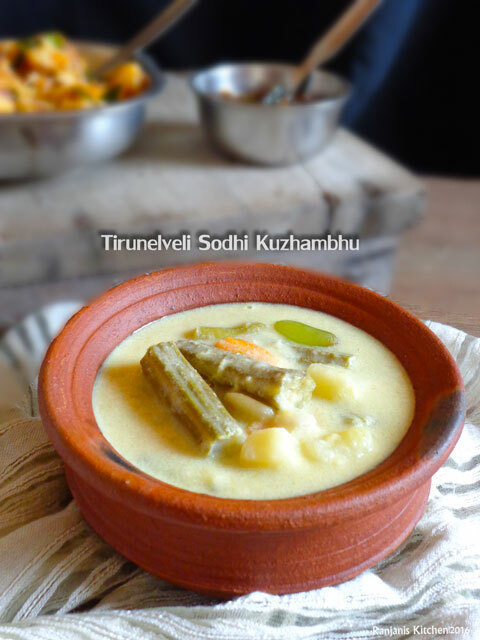 Let the kuzhambhu cools for 10 to 15 mins and add lemon juice and mix well. Add some black or green grapes, mix well and serve with hot rice or idiyappam. Adjust green chilies more or less as of your taste. We can add any vegetables of our choice. Usually beans, drumstick, potato are added in this stew. If using store bought coconut milk, dilute with water for thin milk. ¼ cup of moong dal is enough to make this level. If you add more moong dal, the taste will vary and the kuzhambhu becomes thick.